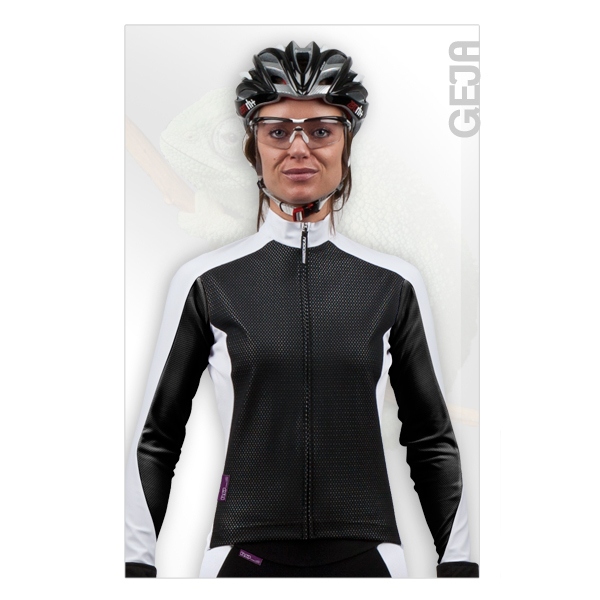 For cold cycling weather, the Geja Ladies Jacket combined with an undershirt is an ideal choice! Thanks to a metallic membrane, the fabric in the front panel is windproof and insulating yet breathable. The side panels and the back piece are made from a stretch fabric, which guarantees a perfect fit. The back panel is made from a light and very breathable fabric that provides cooling during exertion. Woven elastic in the hem and back panel guarantees comfort and holds the jacket in place. The 3-compartment rear pocket, with a zipper pocket in the middle, offers enough room for any accessories. Reflective bands on both sides of the pocket provide extra safety on the road. This jacket looks great due to Lycra piping on the wrists and a concealed zipper that is very easy to use.